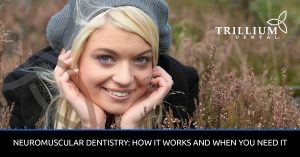 At Trillium Dental, we offer TMJ treatments for patients who are suffering from a popping or misaligned jaw. The temporomandibular joint is critical for jaw movement, and many people have pain in this area as a result of teeth grinding, teeth clenching, or various facial injuries. 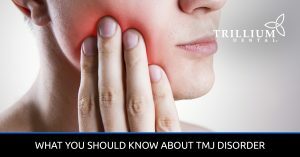 In our TMJ blog, you’ll learn the causes and symptoms of TMJ disorders, as well as how neuromuscular dentistry works and when you need it. 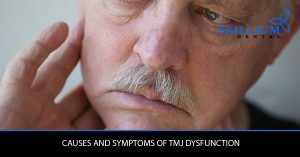 We’ve also provided information about TMJ disorder, including diagnosis and treatment options. If you are experiencing jaw pain or a popping jaw and are concerned that you might have TMJ dysfunction, contact us today to book an appointment.